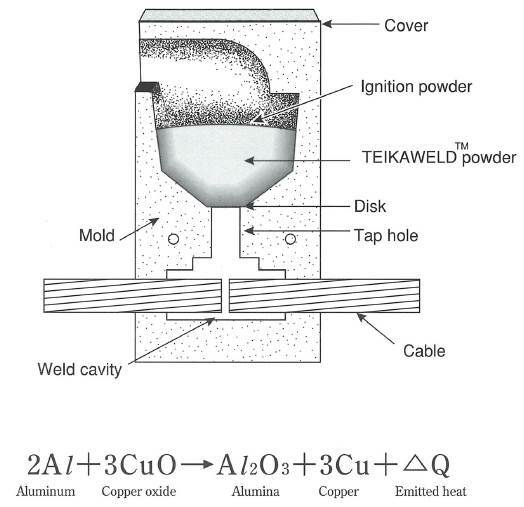 TEIKAWELD™ method is different from the established mechanic crimping method, but rather uses the thermochemical reaction, and so the molecular welding method is applied. Therefore, the transmission of the welded parts are very well, and it will not corrode or loosen. Its high quality can last very long. Since TEIKAWELD™ does not need either power supply or heat source, you can work at any place you need. TEIKAWELD™ Powder contains not only copper oxide and aluminum, but also some specific additive, so that it is safe and helps perform welding quickly. TEIKAWELDTM is specified and approved by a lot of companies and facilities -The Ministry of Land, Infrastructure and Transport, Housing Authority, NHK Technical Department, NTT, JR Companies, Facilities Department of the Japan Self Defense Forces, Japan Coast Guard, many construction companies, Japan Electrical Construction association, Federation of Electrical Engineering Contractors Cooperatives of Japan and others. TEIKAWELDTM can be completed in just 10-30 seconds without the use of electrical power of heat sources. The weld is easily made at low cost using equipment that is so compact that it can fit in the palm of your hand. 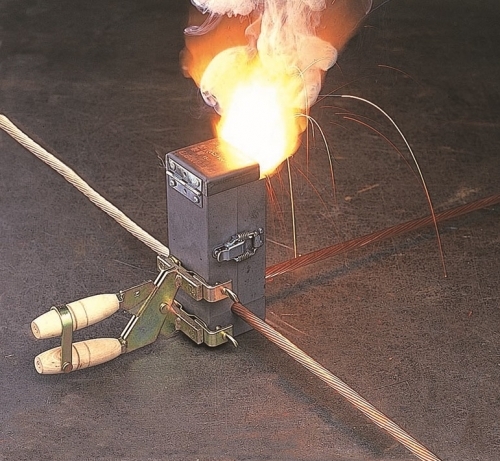 This method is suitable for applications such as earthing steel frames, earthing reinforcing bar, connecting lightning conductors, earth bonding for conduit lightning conductors, earth bonding for conduit pipes and boxes, welding the copper cables of earth mats, grounding connections to gas pipes, water pipes, and so on. Anyone can easiliy make the weld. There are no legal restrictions (in Japan). The tools are easy to handle, so operations can be easily carried out anywhere. The weld is made in molecular level and electrical conductivity is the same as the parent material. No corrosion or no loose at the united point.